Two CPUT students have been featured in a ‘Movers and Shakers’ segment for youth reality television show, Hectic nine-9. Ntskilelo Magwaca and Luxolo Ganca were selected for their inspirational story of working against the odds to get Ntsikelelo registered and admitted for the Graphic Design Course earlier this year. Their story started more than six months ago when Luxolo met Ntsikelelo at the Waterfront and complimented him on the realistic self-portrait he was sketching. 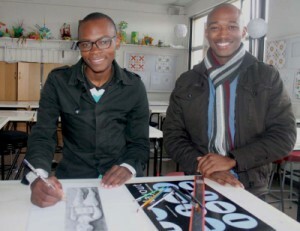 The conversation between the strangers led to a promise from Luxolo that he would assist his new friend in attempting to register for Graphic Design at CPUT. They met a day later and despite being over six months late Ntsikelelo’s portfolio blew lecturers away and he was accepted for a place in the Extra Curriculum Programme from Graphic Design. Together the 20-year-old’s overcame a number of smaller hurdles along the way like getting the registration money paid and getting a starter stationery kit for Ntsikelelo to complete assignments. The positive story reached Vice-Chancellor Prins Nevhutalu who shared it with the CPUT Council during a meeting. Council member Meko Magida who works for Golden Arrow Bus services pledged support and Ntsikelelo will soon be awarded a full bursary for the duration of his studies. Nevhutalu says both Luxolo and Ntsikelelo are examples of the socially responsible student that he wants CPUT to produce. “I want a CPUT student to be different from other graduates because they care. That spirit will infuse everything we do here at the university and seep out into the rest of the country. I would be very satisfied if I had a university full of Luxolo’s and Ntsikelelo’s,” he says.